The tortillas are thin disks of cooked dough , which have many applications in the Mexican cuisine. In this occasion the tortillas are going to be prepared with wheat flour and it is a variation of the corn tortillas’ recipe. The wheat came to Mexico from the hand of the Spaniards in the XVI century, since they did not find the necessary ingredients to make bread. The Spaniards that lived in Sonora started sowing wheat and making the “zaruki", a mixture of wheat with water that later on became the flour tortilla . Since that time the flour tortillas from Sonora are famous although it is stated that it was not until the year 1960, in which the flour tortillas were unveiled to the center and south of the Mexican Republic. However in Mexico the most used and the most popular tortillas are the ones of maize. 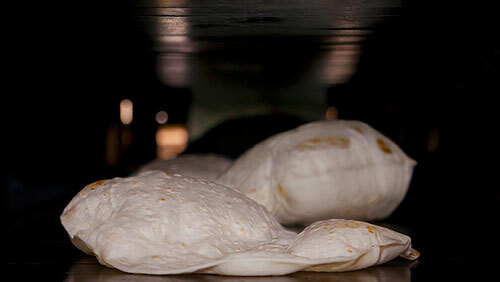 There are also dishes that specialize in flour tortillas like the melted cheese , the sincronizadas , the burritos , etc. A big advantage of the flour tortillas is that in countries outside Mexico, where the maize is not abundant, the style of eating Mexican food with tortillas can also be experienced. The flour tortillas are easy to prepare although it is a laborious recipe because the dough has to be prepared by hand. Due to the dough consistency that is used to prepare the flour tortillas, it is better to make them with a rolling pin and not with a tortilla press. Use a tortilla container in this recipe so the tortillas remain warm for a long time. The preparation time is long, like of 1 hour , since the dough has to be left resting. This recipe is for 12 flour tortillas. Sift over a bowl 4 cups of wheat flour, with a strainer. The wheat flour has to be sifted so it is more pure, so it is easier to work with it and to obtain better results. 1/2 cup of Vegetable Shortening. Mix very well the bowl ingredients with the hands, until having an homogeneous mixture. Pour in the bowl, in intervals, approximately 3/4 cups of hot water (6.3 fl oz) while you work the dough with the hands, until it has a soft texture and an elastic and firm consistency. If your dough doesn’t come out well don’t worry, it can be corrected. If the dough is too soft add more wheat flour, if the dough is too rigid add more water. Make with all the dough that was left resting small dough balls, the size of a golf ball approximately; then set aside. If you want to be too precise, the dough balls should weigh about 1 oz. But if you want to make tortillas for burritos (which measure about 9.5’’ in diameter), the dough balls should weigh about 2.1 oz. Put on a work table and on a rolling pin some flour. Put on the work table one of the dough balls that were made, crush it and start kneading with the rolling pin back and forth, until having the form of an oval. Rotate the flour tortilla 45º clockwise and knead with the rolling pin back and forth, until the tortilla is thinner. Once again rotate the tortilla 45º clockwise and knead with the rolling pin back and forth, until having the form of a circle. Then set aside. While the flour tortillas are made consider the ideal size of the tortilla is of approximately 5.9’’ in diameter x 2 mm thick. Repeat the same procedure with all the dough balls with the ones you did not work. Heat a griddle over high heat. Then reduce to low heat and put over the griddle the flour tortillas that were made, just the ones that fit in without overlapping. Cook the flour tortillas that were put on the griddle for about 30 seconds, until some bubbles pop up. Turn the tortillas that are on the griddle and cook them for about 30 seconds, until some bubbles pop up. Once again turn the flour tortillas and cook them for about 15 seconds, until they are well cooked. Transfer from the griddle to a tortilla container the flour tortillas that were cooked. Repeat the same procedure with the flour tortillas that were not cooked. Tip: Cover the interior part of the tortilla container with a cloth so the tortillas remain warm for a longer time. Variation: Do you know the blue tortillas ? Did you like the Flour Tortillas? ➤ Spiced Coffe.- A coffee with a very special aroma and flavor. ➤ Green Bean Salad.- A fresh salad full of flavor. ➤ Puebla Style Rice.- A very different rice but very tasty. ➤ Lima Soup.- Freshness and an interesting flavor. ➤ Cecina.- A beef with an artisanal flavor. This is the most important instrument to prepare the tortillas. If you don’t have a rolling pin, this is a good option. The “Royal Baking Powder" is excellent to make tortillas and many more recipes. To prepare the dough you need a large bowl of good quality. The “Misc Imports Bowl" meets all these qualities and more.